I’m not very good at stuff. I’m rubbish at housework and doing the garden. I have no interest in craft or baking. And I’m crap at it anyway. My kids live on food from the freezer and microwave meals. Because they’re fussy and because we’re always busy, but, yes, also because I’m a rubbish cook. I’m not a strategic thinker. Life’s too short – I’d rather get on with it than plan and ponder and see the bigger picture. And on the rare occasions when I do think strategically, I don’t even realise I’m doing it. Cos it’s just common sense, innit? I get freaked out by Doing Stuff. Basic stuff. Like opening the bonnet of my car or unlocking a door. Don’t give me a new key or lock to deal with because it most definitely won’t work. It’s definitely broken. It’s definitely not just me…. Let’s be honest, I really don’t have many talents. I got a fold-up bike for my birthday. I love it, it’s given me a new lease of life. I’m not much of a driver. Actually, I’m a crap driver. Add that to the list. So now on my days off if I just need to nip into town I take my bike instead. I love the freedom of it. OK, I admit, if I decide to use it and I realise my 10 year old son has already gone to school without unfolding it for me, I panic slightly. What if I can’t manage it?! Let’s remember this is a FOLD-UP BIKE. It is designed to fold easily. So why does it leave me in a cold sweat. Why can’t I do it? And if you’re reading this and getting all angry for me, then don’t. Because he’s right. I’m not good at stuff and he accepts that and helps me with things. My younger son helps me too. ‘So what is your trick?’ I hear you cry. This. This is my trick. Writing is a big part of my work as a press officer. I blog rather a lot (as you may have noticed) and I’m not too bad at it. I am the biggest grammar geek I know. In an office full of ‘communications professionals’, most of whom are senior to me and paid more than me, I am the go-to girl for all those difficult grammar questions and proof-reading. I can spot a misplaced comma at 100 yards. 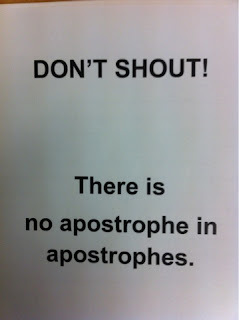 My obsession with grammar is legendary and the source of much humour in school governors’ meetings – woe betide anyone who puts a capital letter or (shudder) an APOSTROPHE in the wrong place. My one and only trick does have its uses at home. I help the kids with their homework and can answer their increasingly difficult questions. Part of loving writing is also loving reading and this has rubbed off on my children. By reading to them and with them I’ve shown them how exciting reading can be. But it doesn’t get my bike folded, the cooker cleaned, the weeds pulled up or decent food on my kids’ plates. What a trick to have. We can’t all be good at everything but being excellent at one thing is great. Love it! I just rode a transformer bike last night for the first time and my stepdad and 7yr old put it up for me. There is no way I would get the hang of it. They are super cool, but complicated looking. I also like to just get in with things without planning and sometimes (a lot of times) this doesn’t go right, but it is a nice surprise when it does. I must admit that I’m scared to comment because I know that I don’t write properly and I know that is annoying! I’m just hoping that auto correct caught everything! I can relate to this. I often feel like I’m not very good at anything, I am not the sort of person with talent. I used to want to be a writer, but I’m realising I’m not very good at that either! So be glad you have such a wonderful skill, that will be your legacy and is worth much more than always having a perfectly tidy house! But it’s a good trick to have 🙂 More of a talent really! Ha ha! But what a great writer you are. I don’t think I have any talents! I used to dance but clearly I can’t any longer. In fact, just before my mobility deteriorated I was looking into adult dance classes! 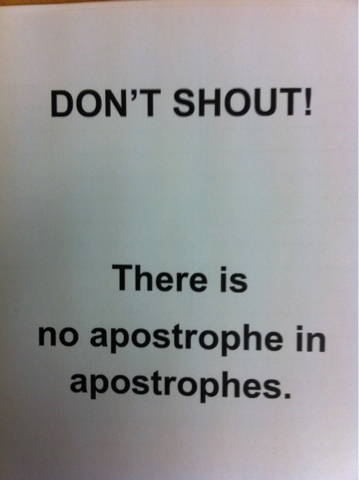 Apologies to anyone who feels nervous about their apostrophe use! I’m not judging you, honest! Katie and Christine – glad I’m not the only who finds folding stuff difficult! Thanks very much for the compliment, Nikki! Really appreciate that. Impressed that you are practical! It’s better to be great in a few areas than mediocre in everything. I’d personally rather read to and inspire my children than be skilled at folding bikes! I love your trick. It is a great trick and is much more beneficial than baking a cake which will only make me fatter. Give me an erudite and learned trick any day. Glad it’s not just me, Lisa! The other day I was struggling to get my half-folded bike into my car and I couldn’t do it because I couldn’t get my bag off it (and because it wasn’t folded properly)! A kind gentleman helped me to remove the bag! Thank you for your support, Rhiannon and Kriss! It is a good ‘trick’ to have, but my husband would rather I had a little bit more common sense! I don’t blame him really, I would quite like some! Thanks very much, ladies. Good to know others fear folding and unfolding, Judith! Scary that the bike decided to fold itself while you were riding, WWofL! Thanks very much, ladies. Exactly, Mummy Tries! Looking after three kids isn’t easy and I manage to do that! I don’t manage to do any enriching activities with them, but I get them out of the house on time, feed them, help with homework and everything else. Lou – I’m not even OK at most things! So many people have said they’ve had to proofread their comments on this one! Ironically I never proofread my comments, although I always proofread my posts, so sometimes I do make mistakes in comments! I’ve visited your blog a few times, Orli, and not been struck by the apostrophes, so they can’t be too bad! I’d be happy for you to fold my bike in exchange for my comma services! 😉 Thanks very much for taking the time to comment. Aww great post, you are a brilliant writer. Writing is my weak point, I can never write it the way I think it, if this makes sense lol. but as you say we can’t all be good at everything 🙂 Thanks for sharing at the weekend blog hop..